Awesome. And I have a 304 in a 79 AMX....Which I am keeping in the car. And probably get decent MPG .while cruzin . Milled a notch in the air gap. Did not try a spacer. Quick fuel mechanical 600 brawler carb was very good out of the box. I believe you called it on this one John. 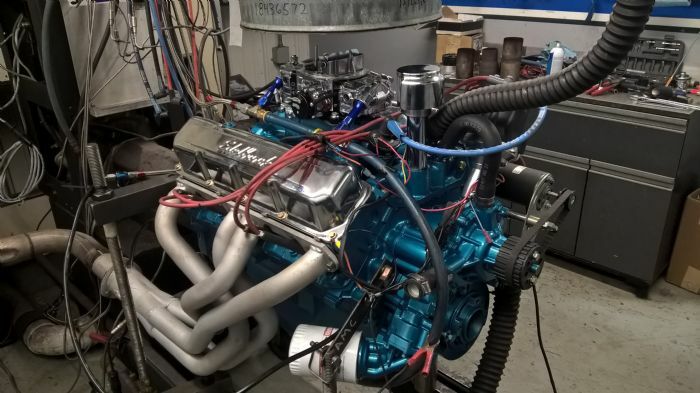 On the "304 Ported Heads" thread Dec. 15, you said "I am hoping for 350-375 horsepower with this combination." Looks like you made it. Oh, how I want!!!!!! Well done, sir! Are you planning to use headers or freeflows? 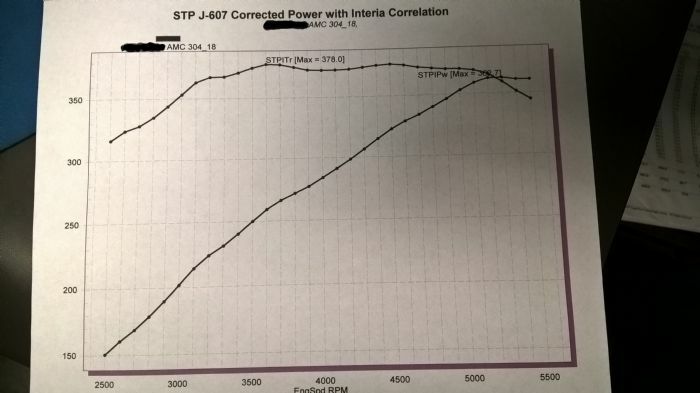 I have a question on the 107 degree, my though's are going to 109 degrees would flatten the torque curve a little but put more HP on the table at a higher RPM. That little stroke engine should rev out to 8000 RPM with ease and not hurt bottom end much at all. You have been in the 0.52x" lift on most of your builds so it looks like you found the sweet spot for a cast head AMC. How are you picking your separation angles? Results are excellent!!! That little cam is not an 8K cam by any means. I expected the power band to be where it is. In the car 6K is no problem but 8K is way out of its power band. This engine can rev will past 6K but why, it will not be making any power there so it does not make sense. I chose the separation angles based on the small cubes. I wanted to help it on the low end and meet the customers needs which is a very user friendly street engine for his wife in the Hornet wagon. did you test a bigger carb just out of curiosity? 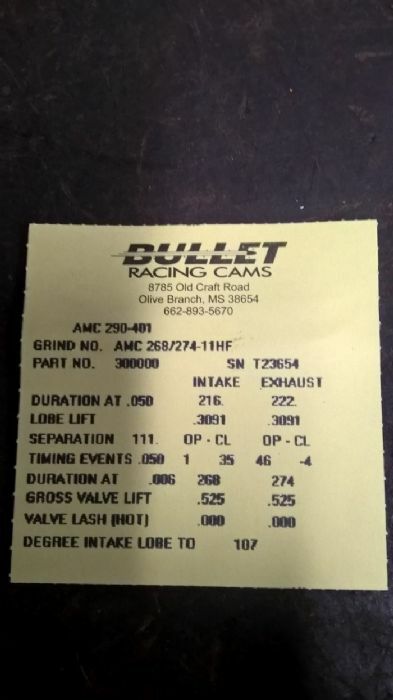 with the small engine and low rpm it probably didn't use all of the 600 but i'm just curious. 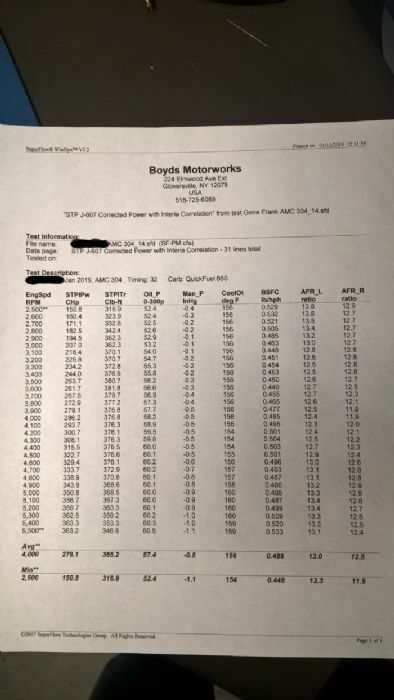 and i'm also curious about the headers i would think a set of 1 5/8s would've provided a better torque curve and maybe more power. i know we went from a set of 1 5/8s hedmans to 1 7/8s supercomps many years ago. on 390 with the big summit cam lol and a torquer and it actually lost a little in the 1/4 mile. we dont have easy dyno access here in oklahoma. I did not test any other carbs. Looking at the vacuum through the pull the engine likes the carb size. 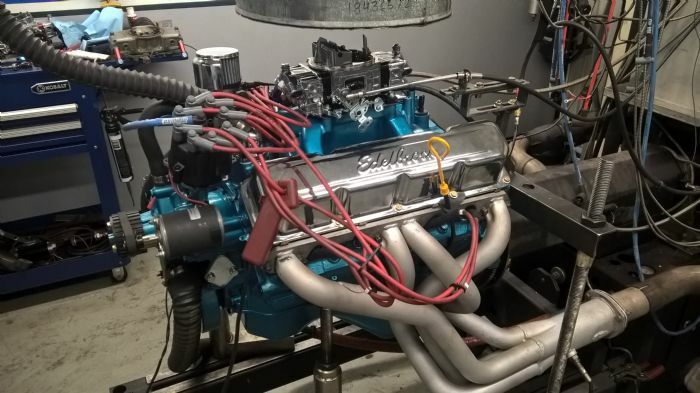 A dream project is a 4" stroke crank in a 3.875 bore 304. Dang I woulda sent you some small tube Jeep headers. Nice job. I knew it would be there, power wise. Going to have to mini tub that grocery getter! This has me wondering if I should rebuild my iron 304 or go looking for an aluminum 401 block and destroke that like I've been curious about for years. The 304 is a torque monster and while I don't have any numbers to reflect that, it's spooky on the street. Your 304's numbers reflect those power jumps fairly close and I don't know how I feel about that. Nice build, would be interesting to see what it would do with a bigger cam to support more RPM and how much HP it could make up there. Bucket loads or torque is perfect for the street though. 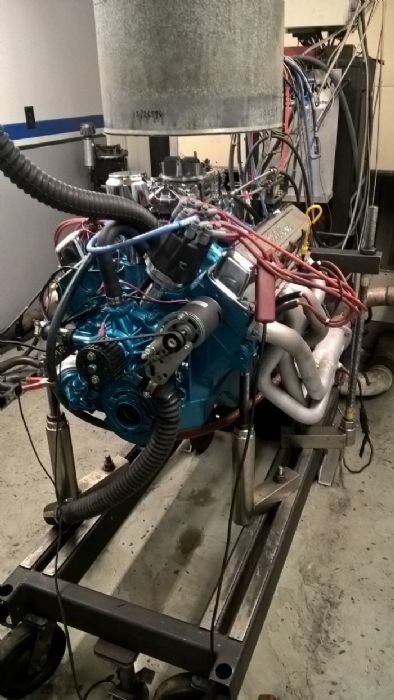 With a larger cam and 1 5/8 headers, I would be surprised if it didn't make 400 or more torque and HP.